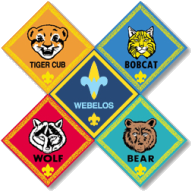 At Pack 475 we strive to address the mission and aims of Scouting by implementing a program that is both fun and meaningful for our scouts. We spend time in the outdoors hiking, camping, and fishing. We perform service projects in the community. Most importantly we learn to appreciate one another for who we are and what we can contribute. Please stop by a meeting for more information or use the contact link to submit a question. We meet on Tuesdays from 7-8PM at Hiss United Methodist Church.